25 photos, mainly of pre-nationalisation coaches. 37108, LNER No 23896, Pullman No 278 Bertha & LMS 45028 (right), Carnforth Steamtown, 26 July 2008. 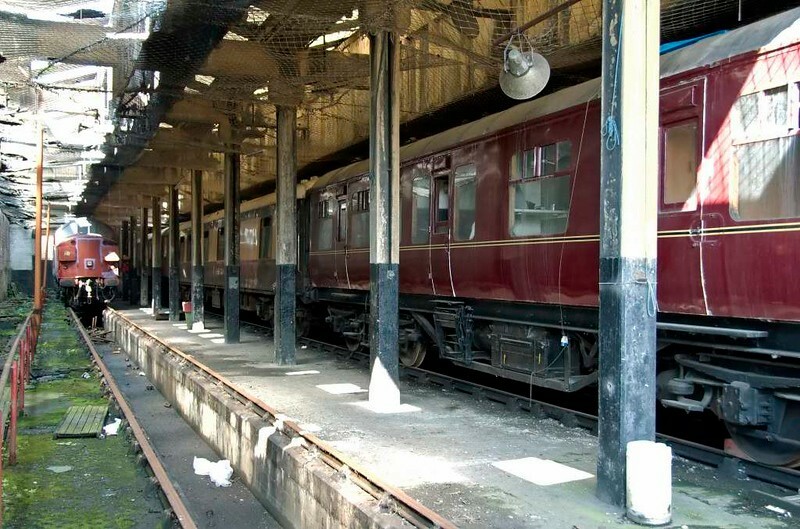 The barely visible LNER coach next to the 37 is a corridor third built by Birmingham Rly Carriage & Wagon in 1935. It had moved to the North Yorkshire Moors Railway by 2010. Pullman Bertha was built by Metropolitan Carriage & Wagon in 1932. It was reported still at Carnforth in 2017. LMS 45028 is a district engineer's saloon built at Wolverton in 1942. It had moved to the Foxfield Railway by 2014.